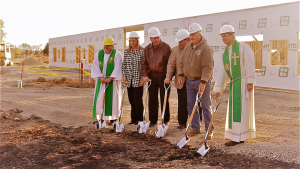 On November 12, 2016 ground was broken for a new school addition to replace the classrooms in the building that opened in 1925. Click on the image to the right to watch a video of the groundbreaking ceremony. A video of the 1966 groundbreaking for the “New School” can be viewed HERE. If you would like to donate to the project please click on the GIVE link above. Be sure to indicate in the Donation Intention area that the donation is for the Future Building Fund.